For the statistical record, the Civil Human Rights Front originally claimed 45,000, but this was somehow revised down to 21,000. The police gave an estimate of 11,000 departures from Victoria Park, but 17,000 for the event as a whole. By my observation, the march started shortly after 3pm and the last of the marchers left Victoria Park before 445pm. Thus, it took 1 hour 45 minutes to clear the start area. In the following, I am showing the photographs that I took during the march. Please be mindful that this is not an exhaustive collection, nor is this a representative sample. 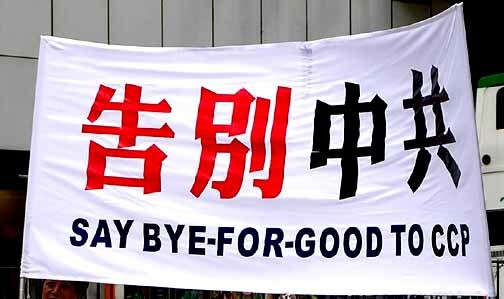 I was standing by the roadside right across the Sogo department store in Causeway Bay, and I was only looking for large banners that were raised up high while my line of sight is unobstructed. When the same sign appears ten times, I only took the first one and ignored the rest. 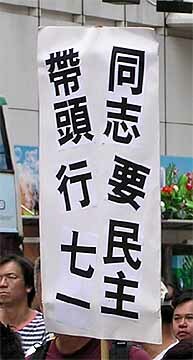 The reason why these banners are of interest is that this march was criticized for no longer possessing one or two compelling themes (such as "Tung Chee-hwa must resign"); instead, there are a plethora of themes, some of which manage to offend certain people. This goes a long way in explaining why the number of marchers is so low this year (see July 1 Afternoon March Estimates). This is also a perspective that is denied to someone participating in the march, for they can only observe what is immediately around them and not throughout the entire column. So I am taking a close look as to what people were saying; this explains what happened this year, and one has to wonder whether there will be fourth year given what happened here on this day. The following photo shows the front of the march. 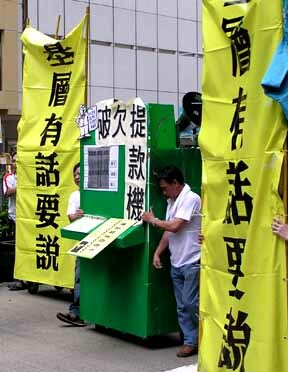 The four vertical banners read from right to left: "Fight for direct elections in 2007/2008", "Improve people's livelihood", "Return government to the people", and "Oppose appointment system for officials." 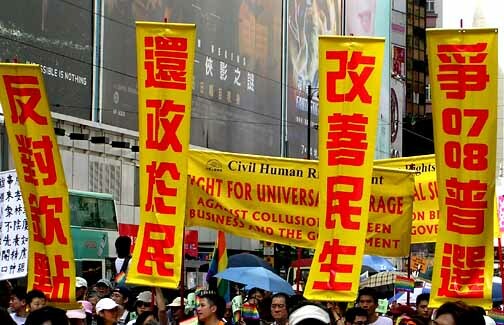 The horizontal banner behind read: "Civil Human Rights Front: Fight for universal suffrage; against collusion between business and the government." 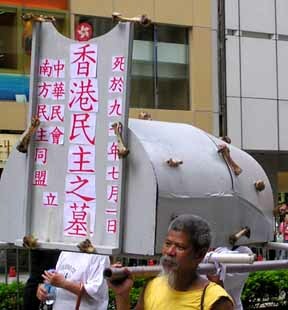 Those are the two principal themes of the July 1 march this year. A preliminary event is a mini-referendum. The Civil Human Rights Front printed 20,000 ballots. The organizers claimed that almost 8,000 ballots were cast. Better than 99% of the ballots supported universal suffrage. It goes without say that this is a self-selected sample of people who have vested interest in universal suffrage. 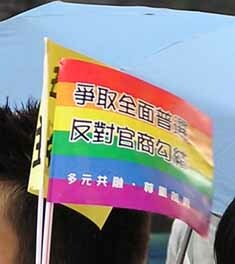 A major controversy this year had to do with the gay organizations being given the positions at the head of the march. 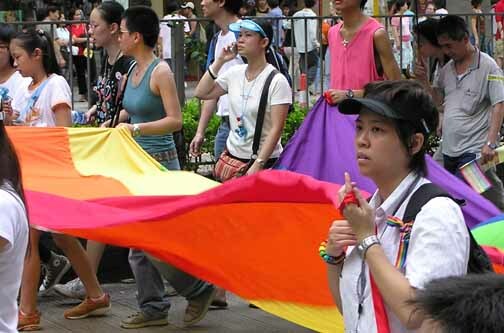 The Truth & Light Society urged people not to attend this march, lest their presence is taken to endorse the proposed legislation against discrimination of gay people (see Hong Kong By The Numbers). The Truth & Light Society also made a point that the Civil Human Rights Society had printed 10,000 flags with the march slogans on top of the rainbow colors; they urged people not to pick up those flags, again lest they should be take to endorse that piece of legislation. Here are some plain black-and-white signs in support of gay people. 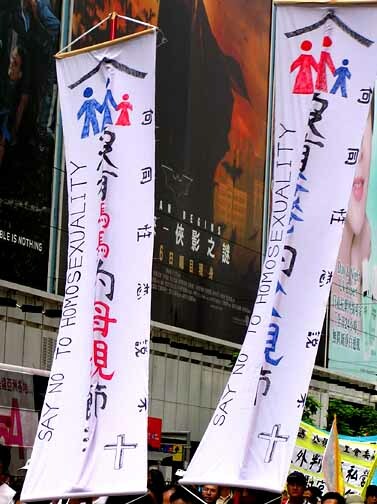 "When the fear of gays does not exist anymore, the world will be lovelier"
"There has to be one nearby; there is no need to be concerned when you meet a gay person"
"Gays lead to get democracy on July 1"
The central line in the left banner: "Mother's Day with no mom." The central line in the right banner: "Father's Day with no dad." 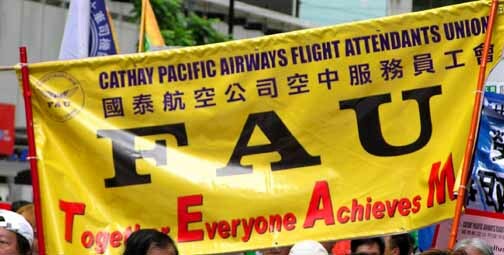 The single most vocal and numerous group out there was the Southeast Asian migrant workers. There were several thousands out there. 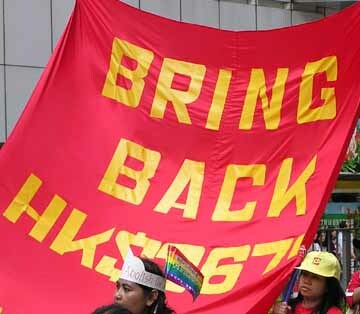 They shouted "Ka Yan Kung" (Cantonese for "Increase wages") and "Bring back HK$3,670" (in reference to the standard monthly wage that they used to get before it was slashed to HK$3,270 during the economic downturn in Hong Kong. 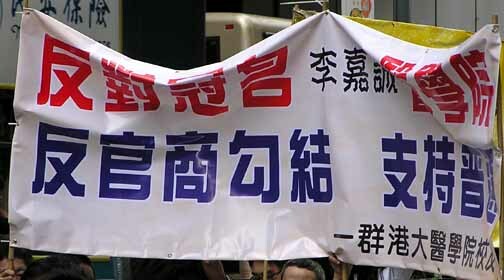 This issue has no obvious connection to the march's two official themes: "Universal suffrage" (which is reserved for residents and not given to migrants) and "Oppose collusion between government and businesses." 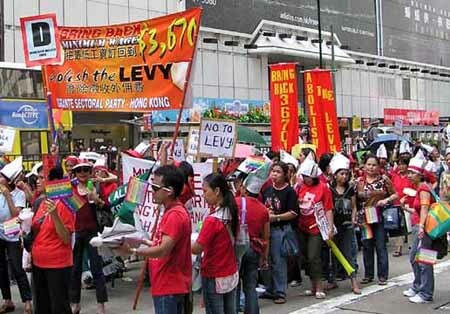 Actually, it is probably not in the interests of the migrant workers to let their wage levels be voted upon by registered voters, given the horror stories about how quite a few horrible employers have illegally pared down the HK$3,270 wage to even lower. The dynamics for this section of the march should be clear. 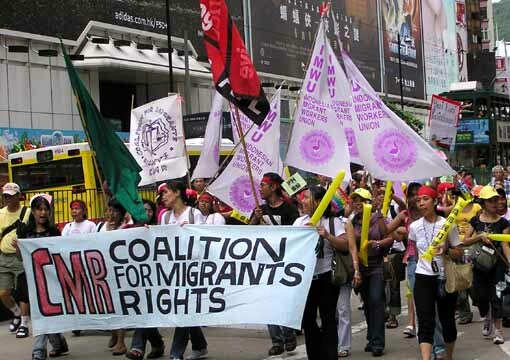 If the migrant workers had gone out and formed their own demonstration march, nobody would have paid any attention. That was why they piggybacked on this event that gets international media coverage in order to get attention. This was a marriage of convenience. Universal suffrage and government-business collusion in Hong Kong have no material meaning for this section of the march. In this section, there the banners for a number of assorted themes. As your read them (in the original or in translation), try to see the connection with "universal suffrage" and "collusion between government and businesses." "Give the students a small-class-size environment to learn"
"Tragic! 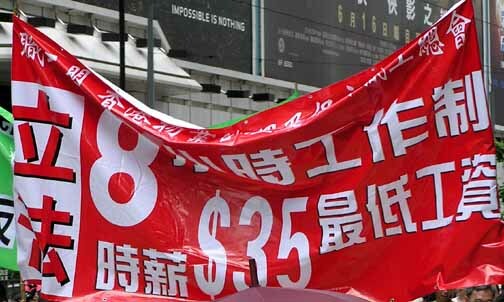 We bought stores at China Travel's Windsor Plaza in Shenzhen and we lost all our money!" 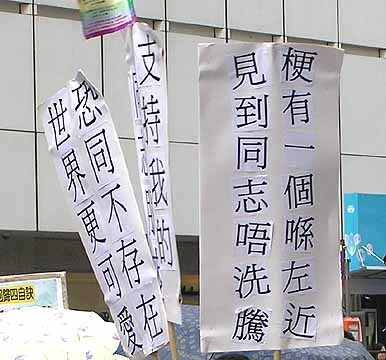 "Oppose putting Li Ka-shing's name on the HKU School of Medicine"
"Oppose collusion between government and businesses and support universal suffrage"
A group of HKU School of Medicine Alumni. 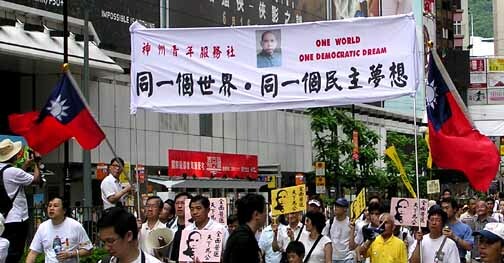 "Legislate 8-hour-work-day and minimum HK$35 hour wage"
Republic of China flags, photo of Sun Yat-sen; "One World, One Democratic Dream"
there is no tomorrow for Hong Kong"
"The base has something to say: The broken cash machine"
Died on July 1, 1997." Stuck near the back of the march were the political parties, by choice. 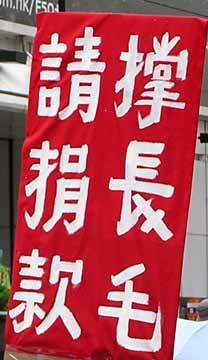 In the first year, the political parties led the march and that decision was criticized by people who said that this was just free political advertising. 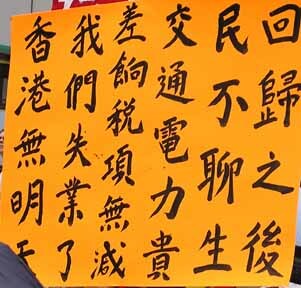 "The Frontier: Defend freedom, return government to the people"
"The Democratic Party: Democracy: Oppose collusion between government and businesses, fight for universal suffrage"
"Support Long Hair; please donate money"
And now for the most common sight seen in this march. 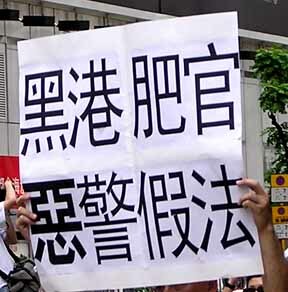 No, these were not the "oppose collusion between government and businesses" and "fight for universal suffrage" signs. Here are the signs. Look at them and think about what this march looked to be about. The Chinese Communist Party equals anti-China"
"The CCP massacred 80 million Chinese compatriots"
Bloody party violent crimes are unforgivable"
Return Zhang Lihong, the mother of two children"
"The nine genes of the evil nature of the Chinese Communist Party"
Resign from the party to save yourselves"
July is the worldwide resignation month for CCP members"
Epoch Times is facing closure"
Call for everyone to support its effort to start a printing plant"
Please release my mother quickly"